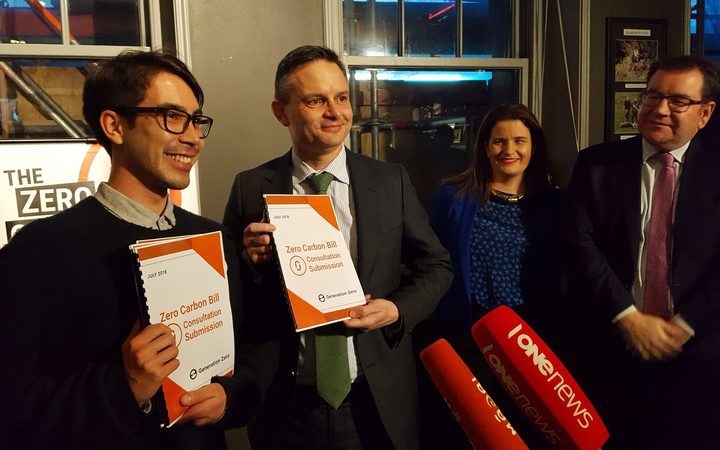 The young New Zealanders credited with driving momentum for a Zero Carbon Act have implored MPs not to mess it up in the final stages. Youth-movement Generation Zero last night formally handed over their submission on the proposed law to MPs from the Labour, Green and National parties. Roughly two years ago, the group began campaigning for legislation to set the country on a path to be carbon neutral by 2050. Spokesperson Laura Somerset recounted the moment, as she spoke to MPs at the Backbencher pub across from Parliament. Since then volunteers had poured “every bit of energy and knowledge and sanity” into calling for the legislation and exploring what it could look like, she said. Fellow spokesperson Victor Komarovsky said New Zealand had dramatically changed from the divisive landscape just two years ago. “Look at us here now!” he said. Generation Zero wanted a bold Zero Carbon Act which covered all greenhouse gases including methane, the advocacy group’s submission said. Ms Somerset called on the MPs to come together and pass the legislation unanimously to ensure it lasted. “The climate action movement has been driven by young people because we have the most at stake,” she said. Climate Change Minister James Shaw accepted the submission and said he would personally read it. The legislation was “directly the brainchild” of Generation Zero, he said. The government had received more than 9000 submissions on the bill, about 17 times more than usual. Finance Minister Grant Robertson noted the need for MPs to work together across the political divide. National leader Simon Bridges last month pledged to take a bipartisan approach to climate change policy, promising to work with the government to make meaningful progress. National MP Nicola Willis said she was very hopeful Parliament could find consensus over the bill. “There is no doubt – and the National Party agrees – that climate change is the biggest environmental challenge of our time. Public consultation closes on Thursday at which point the government will consider the feedback and begin drafting the legislation.